At IQMS, all QA Specialists go through our standard 90-day Technical Support training program and then when they have enough experience with the software, they may apply for open positions in QA. As the Director of Quality Assurance, what are the qualities and traits that I look for in a successful QA Specialist? Let's look into these traits more closely. Inquisitive and open-minded: If your nature isn't to take everything at face value, QA might be for you. If you see a movie, then go home to find out more about the topic or overhear a conversation and Google the pros and cons, you possess an important QA characteristic. True curiosity and inquisitiveness require an open mind because if you've already formed an opinion, you can't find out the truth. For a QA Specialist tasked with testing comprehensive ERP and MES software, especially at IQMS where nearly every software change is requested by a customer, you have to be inquisitive about everything: the original customer request and what they are trying to achieve, the thought process that led the developers to design the customer request, does the change fulfill the request and does it work with the rest of the software? 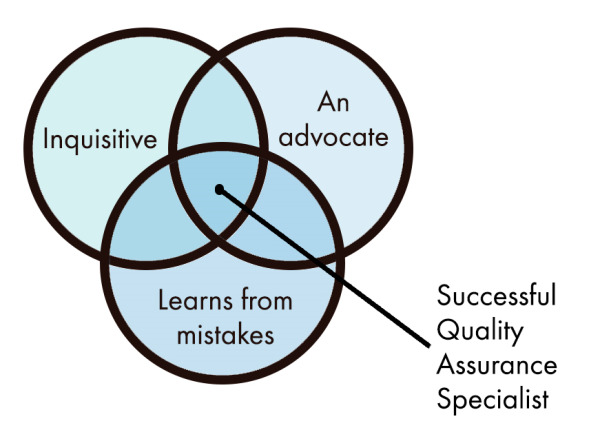 An advocate: QA Specialists can be advocates for both the customer and the company. Customers are how and why we are in business. They need to have their requirements met and they need to be guided to see their requirements can be met in ways other than the steps they are currently taking. In the middle of a development meeting, the QA Specialist needs to be the voice of the customer by translating what the customer is requesting to the developers who do not communicate with the software users on a regular basis. Not only does a QA Specialist have to advocate for the customer, they have to advocate for the company (which includes the rest of your customers). With a fully integrated software like EnterpriseIQ, change is good, however it needs to be good for all. At the end of the day, you are an employee of your company, so advocate for the customer, but remember you have hundreds of other users. For example, if a customer requests a change to the sales order module in EnterpriseIQ, then we also need to test CRM Quotes converted to orders, Quick Order Entry Mode, cloning an open order versus cloning an archived order, orders generated automatically through Outsource Central and Auto MRP and web orders from either WebDirect B2B or B2C. Learns from mistakes: There is no better learning experience than making a mistake (you won't do 'that' again). If someone can apply that experience to all areas of testing, they will be evolve in to a great QA Specialist. Dale Carnegie said it best: "The successful man will profit from his mistakes and try again in a different way." IQMS' ERP and MES software solution is complex. Due to its comprehensive nature, a simple change to one screen could cause ripples of changes to other parts of the software. Our Quality Assurance Specialists are extremely knowledgeable about the minutia of every module and work hard to ensure that our software is always in top shape before it ships out to our manufacturers.